While flying at Makapuu we have always noticed that the best days to fly on the east side of the lighthouse are the hardest days to get there. We have always known that in the old days Reaper and the rest used to hike up and launch there. I can't remember anyone in modern history, except maybe for Mike Doyle, hiking up and launching from there. Sure it suffers from a few problems like: "What, no bombout!?" (there is a ledge if you unwisely decide to launch on a light day) or "No thanks, I have given up hiking." Strolling up the road is a lot easier than the "trail" to Tomato Patch. So, I found myself with a bunch of hungry local pilots (and 1 visitor) making the hike this Sunday morning. Wind looked plenty strong at the Makapuu LZ so we loaded up for the hike towards the lighthouse. Funny thing about the lighthouse road is that you are never alone: hikers, boy scouts, runners, kids, babies in strollers, people who look like they never get out all trying to get a glimpse of the whales (not the walking kind) or to take in the views that we paragliders often take for granted. When we all arrive at launch (by the binoculars) the wind sure seems light and appears to be getting lighter, a lot lighter. Odd because it was strong down below and all our sensors are reporting moderate wind. A couple attempts at kiting and the majority see it as a no go and head down. Ken Berry, Peter aka Suicide and myself head up to the top to see if there is anything there for us, we arrive at the top and there is no wind, still, dead, nada. So we sightsee for a moment and start the "Walk of Shame" down. As we near the launch area we notice the wind blowing and whitecaps on the water, I quickly lay out on launch only to find that the wind is already ripping through, with help from Ken and Peter I remove the wing to a safe place and figure I will take a chance with hiking down to a lower spot I have sighted. I pull up into strong wind in front of a crowd of Sunday hikers and up I go into some sweet lifty air. Somehow I fail to impress Ken and Peter and they decide to hike out. I would be alone in the air, but Jetflap Jeff found a perfect launch cycle (before it got too strong) at Koko Crater and was already flying, even if it was a mile away. So I fly for a while then decide to go keep Jeff company at Koko since all the guys who hiked up to launch after him are treated to very strong conditions and they hike down, again, good excercise. I leave the lighthouse ridge at 1500' and pull in to the Koko ridge under Jeff at 1100', it seemed like it took only two or three minutes to get there, I estimate ground speed at about 45 mph, feels good. We fly for a while and then we head in to land at Sandy's with the air filled with kites. Leo launches into some unpredictable air and bounces around for a while trying to get up and finally sinks over to the beach. We see Eddie, the kite king, has bought himself a new paramotor, he starts it up to break in the motor, but he isn't flying, and as much as I try I can't get him to let me "break it in". So when it is east, kind of a Koko Crater day, yet you don't want Koko's bumpy air, hike up the lighthouse trail by the big whale information sign and give it a try, it is worth it. Alex, I did bring a camera but I gave it to Peter on launch to take a photo and forgot to take it back, the above photo is from my telephone, the rest were all pictures of my finger. Next time. Thanks for the story and picture Dave. I fixed a few typos for you. You know, you can fix them yourself if you want next time - when you log in to your blogger account all the stories you have written are available for you to edit anytime. I think I fixed all the typos, but I couldn't quite make sense of your original intentions for the end of the first paragraph. I took my best shot. Let me know if I screwed it up. I sure wish I could have joined you guys, although I probably would have just watched like the other guys. It doesn't sound like it was a perfect day to try it. I still think it wouldn't hurt to ask the old timers if they remember what kinds of days worked best when they used to launch there. Thanks again for recounting your adventure, and for sharing your snapshot. That's quite a grin you have there! Hey Fireman, Alex. I have a couple of photos I took of Fireman's first launch attempt if you'd like them. Let me know if you want me to e-mail them to you. 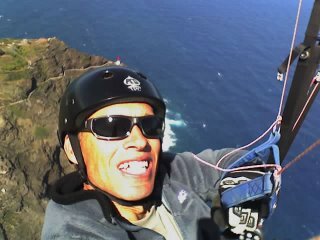 You were really blasting along on your flight from the lighthouse ridge to KoKo , fireman: 45MPH easy. Russ, I wouldn't mind seeing those shots. You can e-mail them to me if you want or just stick them on your Flickr page and let me know. Thanks Russ, Peter took a picture of my actual launch, of course he still has my camera.